Start by preparing your chicken breast. Using a sharp knife, create a pocket in the breast and then set them aside. Dice your bacon, garlic and onion, and fry off until cooked through. Drain thoroughly on some paper towel to soak up any remaining cooking oil. Take your bacon, garlic and onion, and stuff it inside each breast, put just enough in to fill the pocket without the ingredients overflowing. Now its time to prepare a crumbing station. Take the Red Rock Deli chips, and make a tiny hole in the bag to allow the air to escape. Then the fun starts, crush the contents until the crisps have turned into crumbs, these will be used to coat your chicken. Set your crumb aside in a foil tray. Grab some eggs and crack them into a bowl or foil tray, add some salt and pepper, and whisk them up till the white and yolks are thoroughly combined. 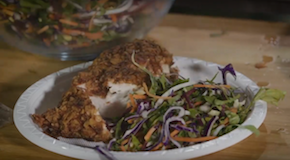 Carefully cover your chicken breast in the yolk, and then the crumb, making sure that there is a generous crumb coating the outside of the chicken. Bring some vegetable oil up to temperature that is suitable for frying (test the heat with a small piece of crumb) and fry off your chicken, two pieces at a time. Once your chicken is cooked through and golden brown, serve with a hefty spoonful of sweet chilly Philly on the top.